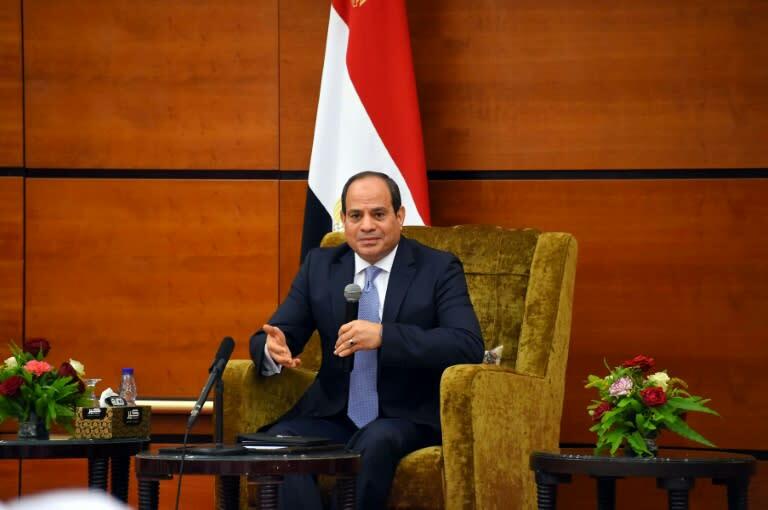 Egyptian authorities have arrested seven people including a former diplomat who had proposed a referendum on the regime of President Abdel Fattah al-Sisi, a defence lawyer said Friday. Masom Marzok, a former assistant foreign minister who had publicly criticised Sisi, called this month for a poll on the former military chief remaining in power. Marzok and the other detainees were arrested Thursday and remanded for 15 days pending investigations, defence lawyer Khaled Ali wrote on his Facebook page. They were accused of several crimes including partnering with a terrorist organisation and colluding to commit terrorist acts, he said. One of them, Amr Mohamed, was accused of joining a terrorist group. Ali said Marzok's had family called him Thursday and told him that a large number of security personnel and vehicles had surrounded the house. Initially they said they just wanted to talk to Marzok, but later they detained him and took him to a location they did not disclose at the time, Ali told AFP. He said questioning of the detainees would continue until Monday. Former armed forces chief Sisi won the presidency in 2014 after leading the ouster of former president Mohamed Morsi, of the Muslim Brotherhood, following mass protests against the Islamist's rule. Sisi was re-elected with 97 percent of the vote in March, beating a single opponent widely seen as a token challenger. Critics say Sisi's government has carried out a widespread crackdown on dissent.